Life Science Talks – Innovation in Healthcare: What is the Point? The following video was created from our 2017 Life Science Talks that took place in June in Paris, France. 1. Sébastien Stoitzner, CEO, GenSearch – LST 2017 – Innovation in healthcare: What is the point? 9.Q&A – Value in Healthcare: Who holds the key? of the different views from the key stakeholders involved. 2015 – Outcomes in Healthcare: Fad or Future? 2016 – Value in Healthcare: Who Holds the Key ? 2017 – Innovation in Healthcare: What is the Point? An established player in HR services dedicated to the Life Science and Healthcare markets, GenSearch has privileged access to decision makers across Europe who are generous enough to spare some of their time and knowledge to enlighten their peers, while welcoming a debate. GenSearch’s BioTech dinners were created in 2014, and aim to bring together Life Science start-ups and other stakeholders (public and private investors, consultants and journalists) in an informal environment. 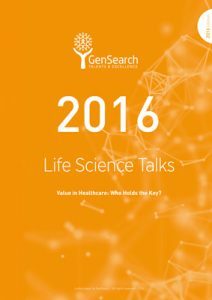 Life Sciences Talks 2016 – Value in Healthcare: Who Holds the Key ?